I began in my earliest years with a passionate need for rhythms, singing, dancing, and performing live in front of people. 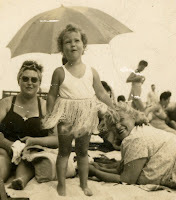 Here I am above, at under three, already dancing and singing on a beach in Rockaway, NY to and for anyone who would listen and watch my baby-antics. I was so cute and innocent that my beloved mother Irene told me I actually drew a crowd. That's my Mom and Grandma Minnie with me. Most of my entire deceased family is in the background. No Afro/Latin rhythm instruments for another two decades, but they happened in a very funny way.... and in my next post, I will tell you all how I became a paid professional by a fateful accident. Having prayed to God until I was becoming a real nag , I finally did a live gig last year and again very recently. Updates to come when I am feeling literate and remember those glorious times. FYI... Music can heal, excite, encourage, and energize or....... calm, put you to sleep, and help your mind to recall or relive happiness. Use it. It is free medicine.... and the only side effects are happiness. We plan to vote "all" the elected officials now in office, OUT!!!!!!!!!!!!!!!!!!!! The pretense of a "closed the gate after the crimes" is a farce. They, the high officials in government, earn far too much money for the crimes they create. And they don't even have to pay into Social Security like we do. HUH! How fair is that? We have been completely suckered by the criminals in government and huge businesses. I am a victim. And I did write, speak and holler against the stealing. Everyone said I was paranoid. Wake up America.